Newsletter+ Software for Email marketing NOV_2014 Free Download - newsletter plus - all you need for email marketing. newsletter plus - all you need for email marketing. newsletter plus - all you need for email marketing. 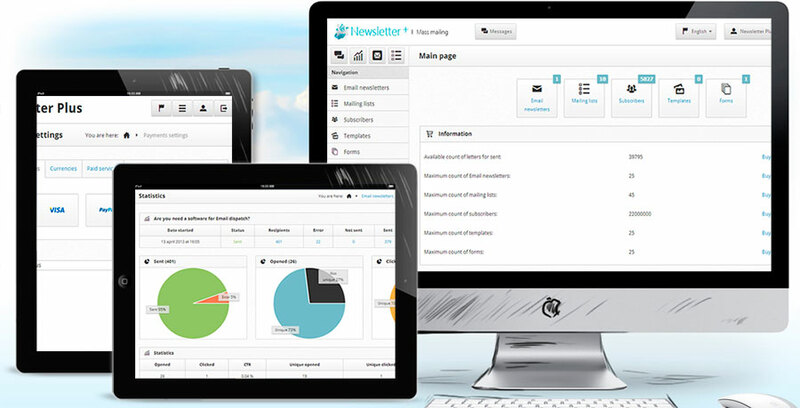 newsletter plus is an easy to use email marketing software. it's easy to use newsletter plus softwares built-in campaign editor to create visually stunning newsletters, promotional emails and flyers. it will take no more than 20 minutes to create an email campaign using our email newsletter software and one of the integrated templates. easy-to-use, intuitive administration interface allows you to administer the product from any location with web access. create hundreds or even thousands of mailing lists and either import your existing subscribers or use our newsletter script to automatically create a subscription form for your web site. newsletter plus software allows you to import from any csv file. you can also manually add subscribers via a simple built-in tool. need a subscriber database for another application? newsletter plus software also features a flexible export tool. newsletter plus software allows you to easily create subscription and unsubscription forms to be used on your site. all you will have to do is to put the html code of the form which will be generated by the newsletter script into your website page. newsletter plus software provides statistics on newsletters that you send informing on the number of clicks, opens, unsubscriptions etc. having this valuable information will help you to determine your contacts' interests, how your list is growing, and much more! with newsletter plus software you can use several ways to send email messages: mail, sendmail and smtp. you can specify multiple smtp servers and adjust the quota for each shipment. also for each smtp server you can specify a mailbox and password to read bounced messages via imap protocol. we've added to newsletter plus software solution for send your letters via api of popular services. amazon simple email service (amazon ses) is a cost-effective outbound-only email-sending service built on the reliable and scalable infrastructure. newsletter plus - all you need for email marketing..